If you currently have a traditional crown, bridge, or denture, you may have wished at some point that there was a restorative solution that could give you back the kind of strong, permanent smile you once had. The good news is that there is. At Dr. David M. Weinman’s dental office in Westfield, we can restore your smile’s appearance, structure, and function with dental implant-supported crowns, bridges and dentures. Like traditional crowns, bridges, and dentures, dental implants work by replacing one or more missing teeth. But what sets them apart is the fact that they also replace any tooth roots you might be missing, too. Made from biocompatible titanium, dental implants work by fusing with bone tissue in the jawbone, creating a firm foundation for your new smile. 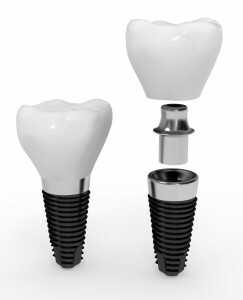 During the first phase of your dental implant procedure, your implant(s) will be placed in your jaw. Then, after that fusing process has been given time to happen, all that’s left is for Dr. Weinman complete your restoration by attaching your new crown, bridge, or denture. What you’ll find afterwards is that your smile functions just like a natural smile, improving your confidence and your health in the process. To learn more about how dental implants can help patients from Westfield and beyond enjoy improved oral and overall health, visit the dental implants page on our website or give us a call. Dr. Weinman serves patients from Scotch Plains, Fanwood, Cranford, Mountainside, and beyond.